Feb. 8. 1916. C.F.W. Clubs met in regular monthly meeting. Eleven clubs [illegible] to roll call, fourteen (14) members being present. Minutes of previous meeting were read and approved. The Pres. 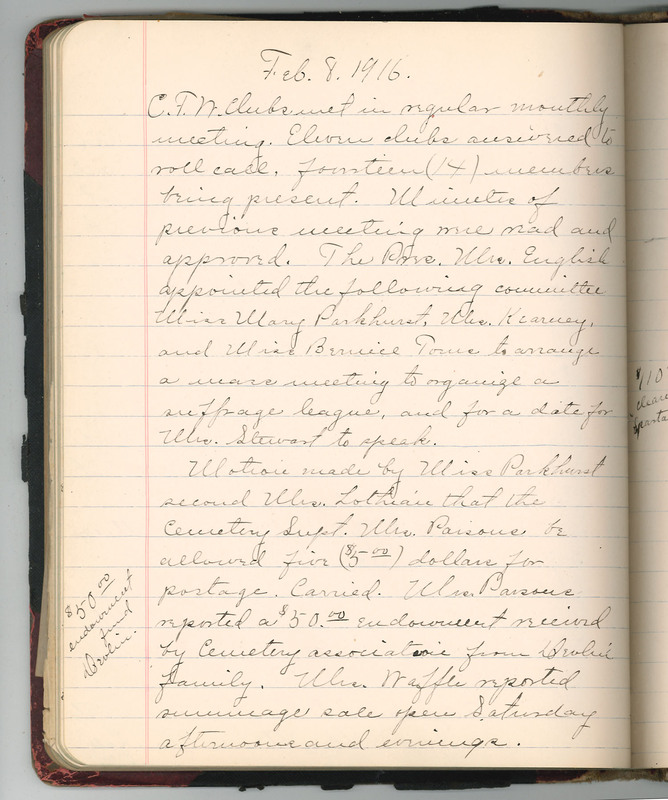 Mrs. English appointed the following committee Miss Mary Parkhurst, Mrs. Kearney, and Miss Bernice [Toins?] to arrange a [illegible] meeting to organize a suffrage league, and for a date for Mrs. Stewart to speak. Motion made by Miss Parkhurst second Mrs. Lothian that the Cemetery Supt. Mrs. Parsons be allowed five ($5.00) dollars for postage. Carried. Mrs. Parsons reports a $50.00 endowment received by Cemetery association from Devlin family. Mrs. Waffle reported rummage sale open Saturday afternoons and evenings.